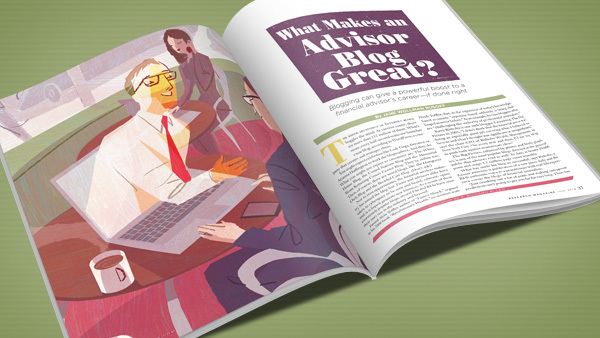 What Makes an Advisor Blog Great? Blogging can give a powerful boost to a financial advisor's careerif done right. The sheer abundance of Internet blogs boggles the mind: At current count, there are more than 152 million of them. What’s more, every half-second someone launches a new blog, according to WordPress, a company that creates and manages them. Not to miss opportunities, the financial services industry has joined the blog fest. Firms and advisors alike have taken to cyberspace to be seen and heard, educate, opine and, it is hoped, generate new business. As a result of their enormously popular blogs, several FAs and RIAs have seen their stars rise in the industry and beyond. The Big Picture, enhanced by photos and lively graphics, is one of the most popular blogs directed at the general public that advisors read as well. To date, it boasts 30,000 posts and snags 1.5 million page views monthly. What has made his blog so successful, says Ritholtz, a former attorney, is publication of a new piece daily and the RIA’s authentic voice as a practitioner with real-life experience versus the blogs of financial journalists. “Just cranking out a lot of posts and making outrageous predictions isn’t going to get you far for very long. There has to be some thought process and real analytic thinking,” he says. That’s the stuff of Bob Seawright’s blog, Above the Market, too. Though written for financial services professionals, consumers are avid readers. Seawright, familiar to Research readers as the magazine’s Annuity Analytics columnist, is chief investment and information officer of Madison Avenue Securities, a BD headquartered in San Diego. Seawright’s posts—minimum 1,000 words—are considerably longer than the typical 600-word communiques of most financial bloggers. But Seawright has lots to say. “I’m just getting warmed up at 600 words,” he notes. Tackling meaty subjects that demand in-depth attention, Seawright blogs less often than many of his colleagues. But when he does, the content is substantial and of high caliber. It might be about behavioral economics, the stock market or financial planning. “A New Kind of Investment Outlook,” which he posted on Feb. 6 of this year, totaled 3,500 words. “Sometimes I use the blog as a commitment device to solidify my thinking. If I’m struggling with how to deal with something, writing a piece about it works really well for me,” says Seawright, who also practiced law before entering financial services. The high-profile Nerd’s Eye View blog for advisors, written by Michael Kitces, a partner in Pinnacle Advisory Group, spawned a flourishing offshoot business for the FA as an in-demand speaker. Kitces’ blog focuses on the wide world of financial services, with thorough pieces about practice management, planning issues, and insightful articles interpreting industry trends. Each weekend, he curates—passes along—a round-up of notable pieces that ran during the past week. The secret to Kitces’ success is a focus on value and, as with Ritholtz, posting articles on a continual basis. He does all his own writing, with help only with graphics and occasional technical support. He launched his blog in 2008 but, alas, with no readers, abandoned it after only a few weeks. By 2010, Kitces had a clear focus as to his target audience and just as important, what he would use to circulate the posts: social media. “I knew how to create content. But I never really knew how to put it out there to get an audience,” Kitces says. “Watching the growth of Twitter, in particular, did it for me.” He remains on Twitter—the biggest driver of traffic to the blog—along with LinkedIn, Facebook and Google Plus. Specialized blogs, if done right, attract a huge following. A prime example is Bill Winterberg’s FPPad blog about technology for financial advisors, started in 2008. With practical information, he zeroes in on tech that enables FAs to be more efficient and serve up a more satisfying client experience. “Advisors already have so much competition for their time. I don’t want to add to the noise; I want to be part of the signal and provide practical takeaways that have specific business applications,” says Winterberg, who formerly wrote software for Hewlett Packard and LeapFrog Toys. This past May, he was gearing up to expand the blog by hiring staff writers to cover specific tech areas. Only a few years ago, it was a major challenge to launch a blog (short for weblog). Today, with the advent of services such as WordPress and TypePad, it’s easy. One of the leading advisor blogs, read by consumers too, is Wade Pfau’s Retirement Researcher. He started it in 2010 when, as an economics professor in Tokyo, he was seeking an academic post in financial planning in the U.S. The Iowa native now has two jobs here: professor of retirement income at the American College of Financial Services and director of retirement research at McLean Asset Management, in McLean, Virginia. Pfau’s blogging forte is explaining complex technical retirement research in easy-to-understand prose. He discusses his own research and also summarizes others’ findings published in journals. Retirement income has become a big issue of late, and Pfau’s blog is one of the few places that delve deeply into the subject. Visuals—ranging from graphics to videos—can give a blog magnetic appeal. On the Meb Faber Research blog, charts play a featured role. And at each week’s end, Faber writes a summary of best tweets—his and others’—accompanied by a number of elucidating charts. Blogging is just one piece of Faber’s social media pie. According to Faber, a combination of the blog plus academic papers and Twitter has “driven the majority” of his firm’s assets, which now total nearly $500 million under management. Most wirehouse and regional BDs have introduced corporate blogs. Some firms, like Raymond James, also have one blog for advisors and another for clients. “Practice Insights,” for RJ FAs, concentrates on such critical areas as practice management, marketing support, and succession planning. Previously, this information was summarized and emailed to advisors. In January of this year the firm switched to a blog format. It is divided into easy-to-spot categories, with concise pieces about, for instance, “The Five Stages of Client Engagement.” Drilling down yields more articles on allied topics. Though “Practice Insights” is written for RJ advisors, it also doubles as a recruiting tool. “Our conscious decision was to make this information available publicly with the [notion] that if advisors at other firms see it, they could infer the kind of practice management support we have. Certainly one of the reasons was that, if advisors at other firms read it, they might develop an affinity for Raymond James. [Indeed], many times advisors from other firms will reach out and say they’d like more information,” says Mike White, chief marketing officer. Other popular blogs for advisors include Abnormal Returns, which does an excellent job of compiling content from other blogs; Scholarfp by fiduciary standard advocate Ron Rhoades, who is with Western Kentucky University; Seicblogs.com, highlighting experts’ practical tips; Charles Sizemore.com, focusing on smart investing and global trends; and VanguardAdvisorsblog.com, wherein the firm’s experts write about a variety of critical topics. Advisors should also pay attention to these winning blogs aimed at consumers: Good Financial Cents—easy to navigate and with lots of good visuals and personal finance articles like “Why You Should Never Own a Variable Annuity”; Guidevine, with pieces like “Finding the Right Financial Advisor” (Guidevine also has a blog for FAs); Low-Stress-Investing.com, by CFP Andy Millard, packed with videos of the telegenic Millard discussing personal finance; Oxygenfinancial.net‘s Smart Money by Ted Jenkin and Kyle Lewis, which, aimed at Gen X and the millennials, exudes personality and humor; the Reformed Broker by Joshua Brown, CEO of Ritholtz’s firm, who writes funny stuff—about finance, politics and culture. Advisors who’d like to take a crack at blogging with a view to adding new clients should keep in mind a few key points. First: “You need to know who you’re looking for to attract the right type of [prospects] and subtly repel the wrong kind,” says Marie Swift, president-CEO of Impact Communications, a Kansas City, Missouri-based marketing and PR firm specializing in the financial services industry. If writing isn’t a strength, advisors can hire a ghost-blogger or purchase inexpensive custom blogs written to their specs from companies like Blogmutt. Bottom line: As the top advisor blogs have proven, blogging helps FAs become discoverable and demonstrate their expertise. When a prospect seeks a particular product or service online, if an advisor has been blogging about the subject, the advisor’s site will crop up. The best of advisor blogs do just that.